Parrots are mainly tropical birds of the order Psitttaciformes, with a short hooked bill and strong grasping feet with two toes in front and two toes behind, which aid in grasping food and climbing. 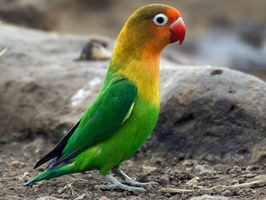 There are more than 300 species of parrots, often having vivid colourful plumage. They move around in flocks, within which they are commonly seen in pairs. Nearly all parrot species are monogamous, commonly mating for years and sometimes for life. Owing a parrot as a pet is entertaining as most of them are able to mimic the human voice. They make affectionate pets, but some species are more prone to bonding to just one person. Origin :Central and West Africa. Cage Size :32 inches wide, 24 inches deep, 30 inches high. 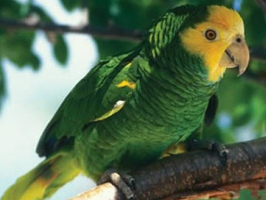 Foods : Quality Parrot mix with pellets, fruit and green vegetables. Life Span :Average 15 years and maximum. 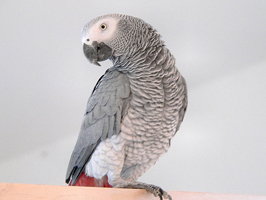 African Grey parrots are stocky, short tailed birds extremely successful as human companions. They are famous for their intelligence and ability to communicate and mimic an extraordinary range of sounds. Needs attention, plucks feathers when neglected. Bites can be extremely painful. Colors are grey and green, accentuated by red, orange, or blue markings. There are two kinds of African greys. The Congo and Timneh Grey. The former has a black beak, grey feathers and a bright red tail and is the larger of the two. Timneh has a horn coloured upper beak, dark grey feathers and a maroon tail. The two share similar temperaments. Origin :Central and South America. Cage Size :Cages should have adequate room for play and exercise. Foods :Grains, parrot mix with pellets, fruits and green vegetables, seeds and large nuts. There are 27 Amazon species, 12 of which are considered threatened with extinction. Eight of the most popular pet Amazons are among the endangered species. Highly intelligent, quickly tamed and easily adaptable to different environments, they make very good pets. They are very good at talking and imitating sounds. Colour is green, accentuated by red, blue, yellow or grey markings. They are very social birds but can be moody at times. They need mental stimulation and attention. Yellow Fronted, The Blue Fronted, the Double Yellow Head, the Yellow Nape etc are some of the different Amazon species who are better talkers of the lot.